Ben is standing on a more regular basis, though mostly we have to trick him into it. 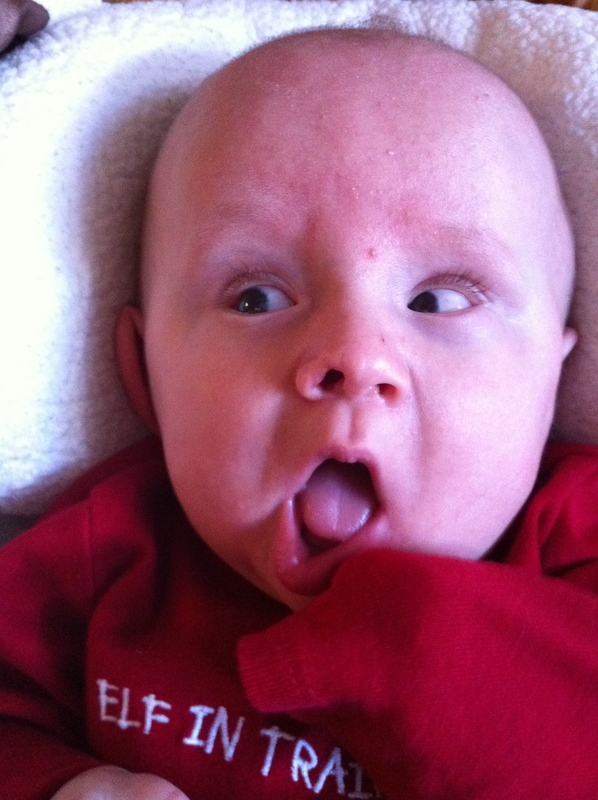 Ben started speech therapy this week! Maybe we’ll get some on-purpose words soon! Speech therapy also includes some feeding therapy. Maybe he’ll start eating things too. Ben weighed 22lbs the last time I checked. This means that after hovering just below 20lbs for 4+ months, Ben has gained over 2lbs in 1 month (and is in the 6th percentile for his actual age). This blows my mind. We’ve been pushing the pediasure, and it’s been paying off. Ben got a super cute pair of Stride Rite shoes. They’re like miniature hiking boots. So cute. Ben’s favorite hobby is trying to take them off of his feet and/or eat the velcro. And finally, here is a poor quality, but very cute, video of Ben playing with a toy. We’ve been working on getting him to drop things he has in his hand for awhile (though he seemed to have mastered the art of “dropping” or even “throwing” at Thanksgiving when he was tossing all offerings of food and toy off of his chair, it’s never been this purposeful), so this was exciting. 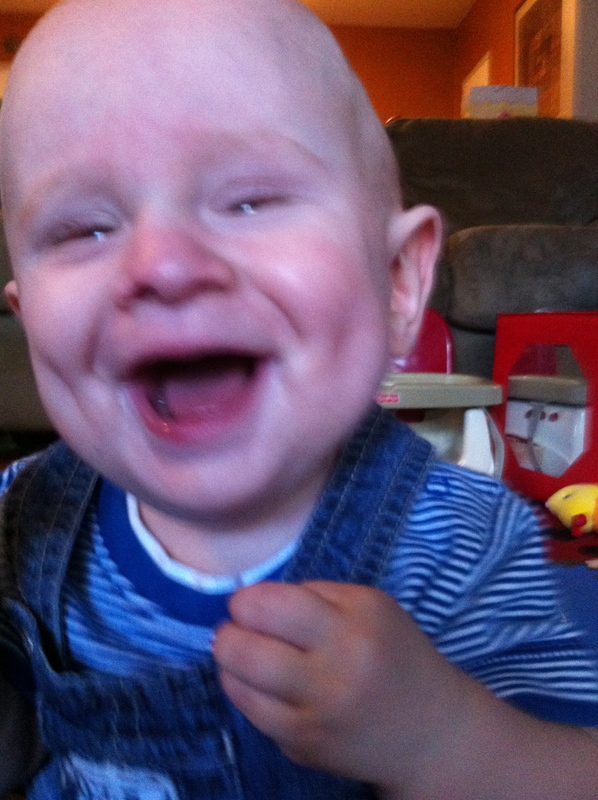 Benjamin has been in an amazing mood lately – all giggles and smiles. He just cracks us up. Occupational Therapy finally started and the therapist and Ben are just getting to know each other now. She is going to help Ben with feeding skills as well fine motor and life skills. I might ask him to take note – I could totally brush up on some life skills. But most importantly – today is Mother’s Day! Happy mother’s day to all the moms out there. Ben got to spend the day with his momma, Gram and Grandma today and got lots of kisses. I personally want to wish Amy a happy mother’s day too. She is an amazing mom and I could never do this with anyone else. This boy wants to crawl so badly! He is almost there too. So far he is able to get on all fours by himself and pushes with his legs, but he forgets to move his arms or lift his head. So he doesn’t get very far very fast. The whole thing keeps him up at night. We find him in the middle of the night shouting, trying to crawl, but fast asleep. Once he can start to move, we are in a lot of trouble, because even just with rolling, he can get all over the place. 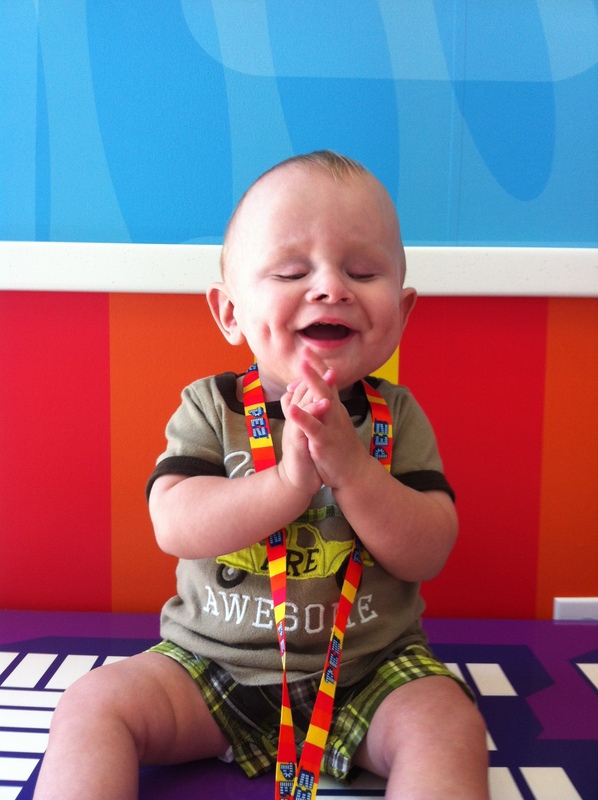 This long weekend Benjamin finally got his evaluations for both feeding/speech and occupational therapies. The evaluations were very interesting, and I’m glad I was able to be home for them. 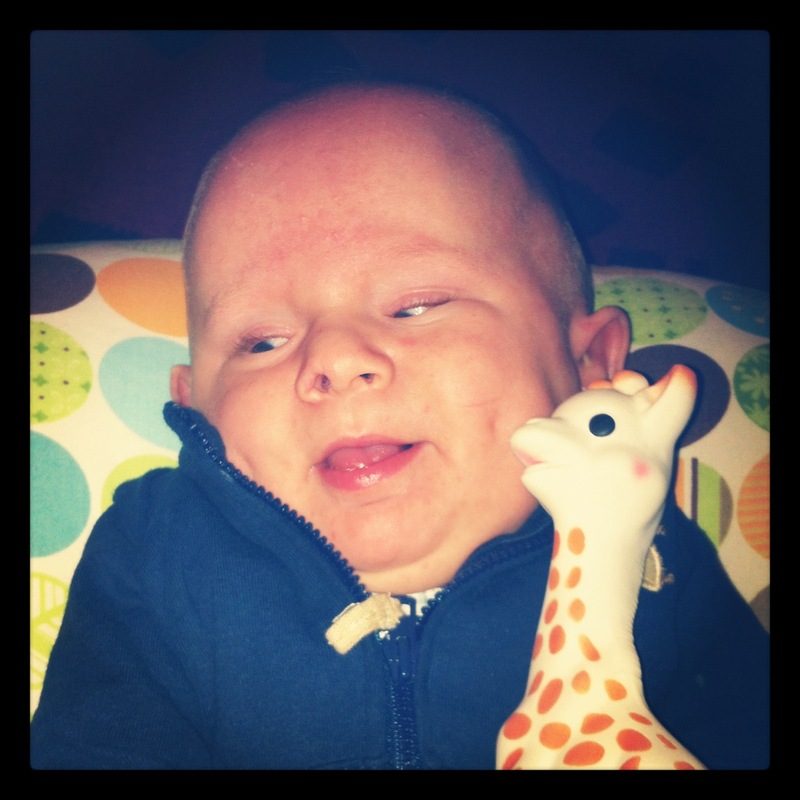 The feeding evaluation was done by a speech therapist because… speech and feeding both use tongues? That sounds right. 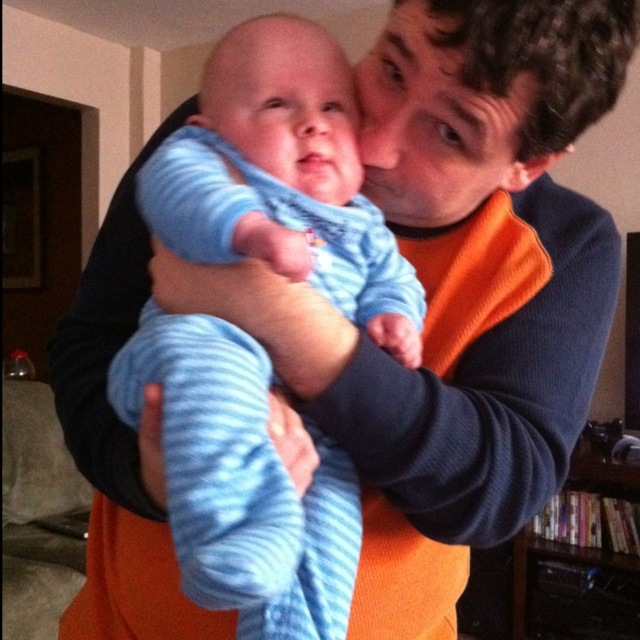 Anyway, he got to see Ben puke after trying to eat solids and gave us hope that things could improve with help. It was weird going over Benjamin’s medical history again – had to dust off that part of our brain to remember all the scary details. Though looking at Ben while we walked the evaluators through all of that made it seem like we were talking about an entirely different baby. In the end both evaluators will be recommending services, and once they get accepted by the state we hope they will start quickly. In other Ben news – he had his 12 month doctor’s check up and everything checked out. He is still small for his corrected age – just 14 lbs, 12 oz. but he’s growing. 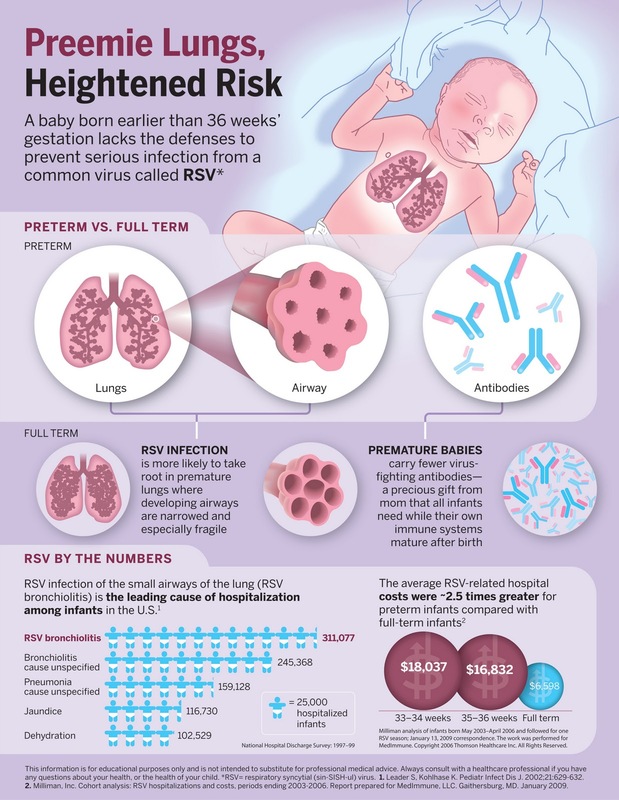 He also got some shots, including his synagis (It’s still RSV season). Other than that he was a happy healthy baby for the doc. How did 11 months pass already? Eleven months! One-One! That’s 31 days until 1 year! Things have been good in Benjaminland. He has now hit 14 pounds at his last doctor appointment, which is great, but he’s still very small even for his adjusted age. Feeding has been on and off difficult, but one of Ben’s therapists is making a recommendation for a feeding therapist. If gets approved it could really help, especially as we increase the solids – which right now just makes him puke. 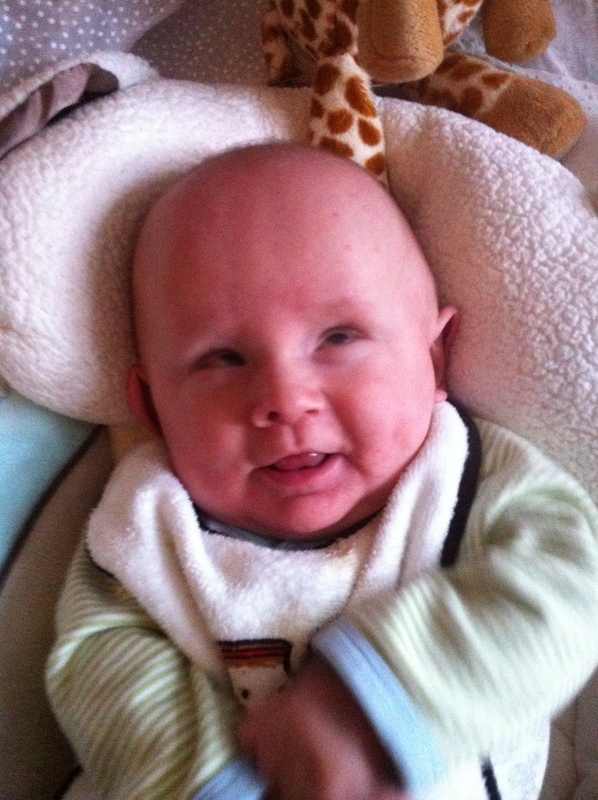 Ben is getting really good at pushing himself up and seems much more interested in moving around. He’s getting to be a strong little guy. We are also hoping to start occupational therapy too. What sort of occupation could Benjamin have, you ask? Well right now his occupation (as listed on the census) is “baby”. So that’s what he’d work on – baby stuff. Though at this rate we’ll have to put in a waiting room at our apartment for all the therapists coming and going. Better late than never – Christmas Ben! It was a very merry Christmas for everyone around here. It’s been a long long year for us and it was really nice to celebrate the holidays with the family. This time last year we were just getting our first presents for our son who we were not expecting until June, nothing but hope as far as the eye could see, all of the scary stuff of 2011 still ahead of us. 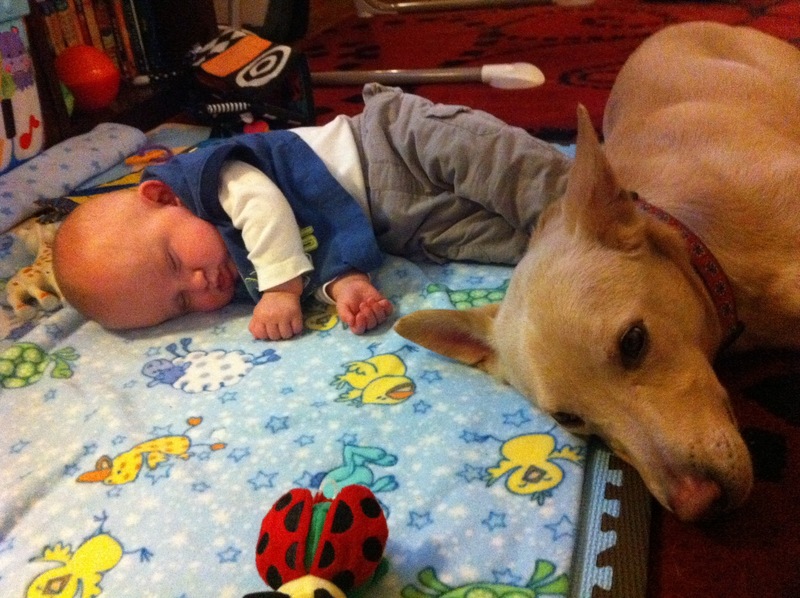 Twelve months later we spent a wonderful holiday with our family and Benjamin, now over ten months old. And once again, nothing but hope for the year ahead. Yee-haw dragon friend! Christmas rocks! Benjamin got some great presents – too many presents! 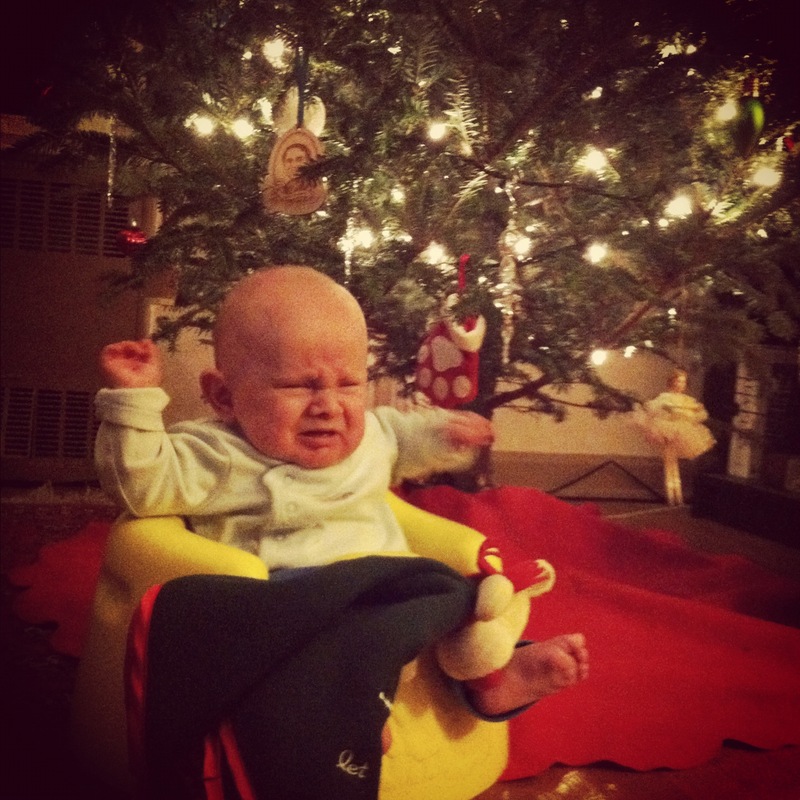 I think everyone was a bit excited for Ben’s first Christmas. Our poor little apartment is busting at the gills. He also got to spend some more time with his cousin Kaia up from NC. Benjamin has also been very busy himself. He has made a ton of progress on his physical therapy and is a champion sitter (for a short while) and he can now roll from his back to his front. 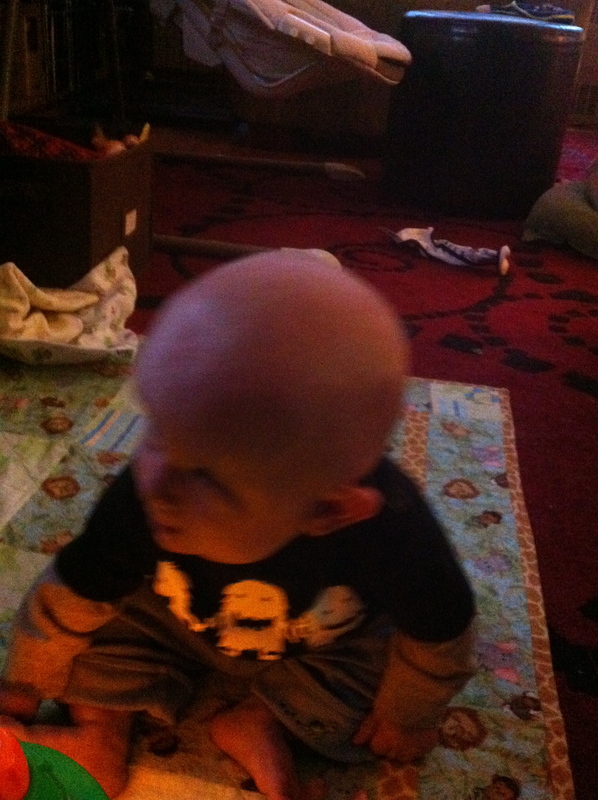 This means he can roll 360 and does so now, ending up miles from wherever we lay him down on the floor. He’s also getting better at pulling himself around on the floor. Now that he’s mobile this is a whole different ballgame. 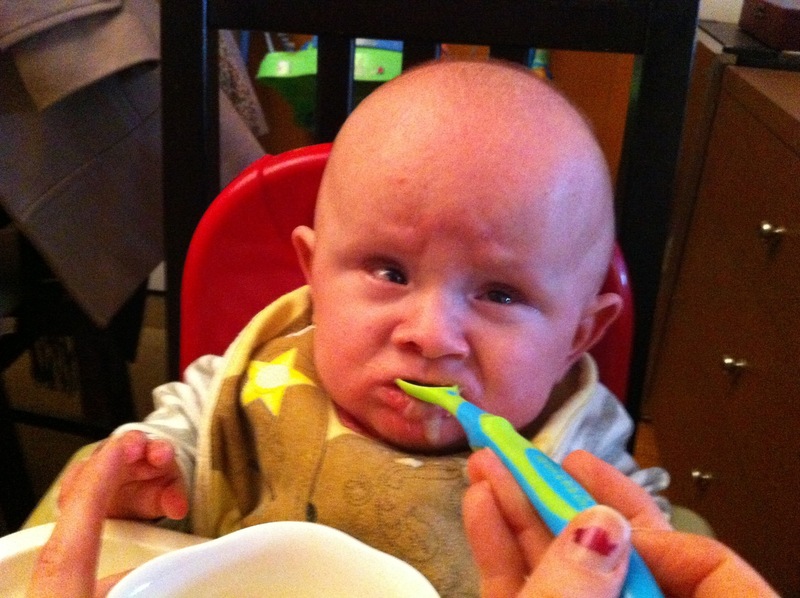 Ben also has been trying some solid foods with varying degrees of success. The rice cereal mostly got eaten, but the avocado we got to see twice. "Not sure how I feel about this food thing"
At his 6-month high-risk assessment they thought Benjamin was doing well and that he was only a little behind his corrected age, testing at 5.5 months. That’s not bad considering how long he was in the hospital. You know that moment in December where you look around and realize that there’s less than a week until Christmas, yet somehow the last time you looked at the date it was Thanksgiving? Yeah, it’s been that kind of month. Here’s what happened, briefly. 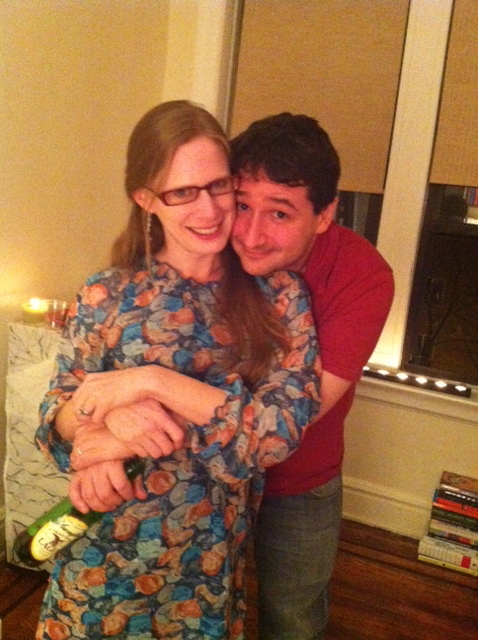 Joe and I have gone to two holiday parties together, sans child. Amy wore earrings and necklaces without fear of them being brutally grabbed by a baby! Thank you for babysitting grandmas! -Benjamin is gaining a ton of neck strength and can hold himself up *really* well with support and for a dash without support. -Benjamin can “tripod” sit independently for just long enough for me to snap a picture before catching him as he tips over. -Benjamin can roll over 3/4 of the way or 270 degrees. He hasn’t flipped from his side to his belly yet, but it looks imminent. 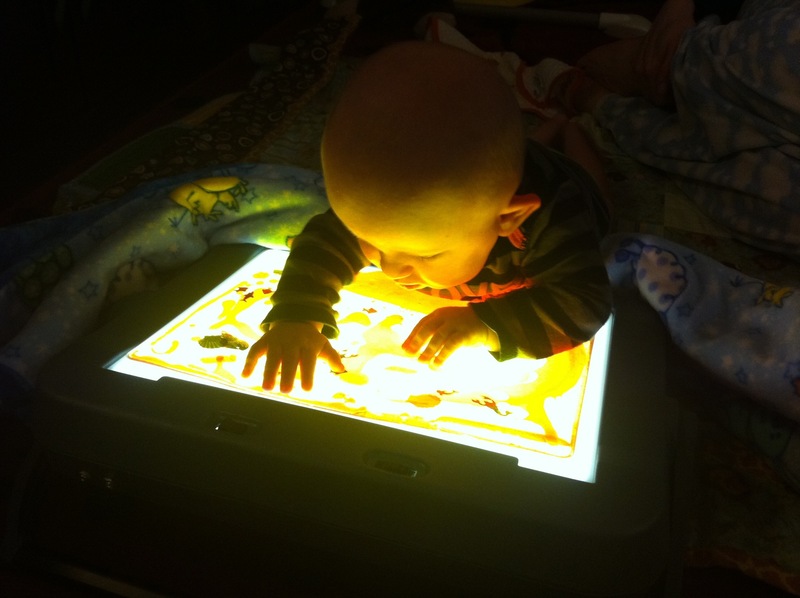 – Benjamin *loves* vision therapy; there’s songs and lights and lots of toys. 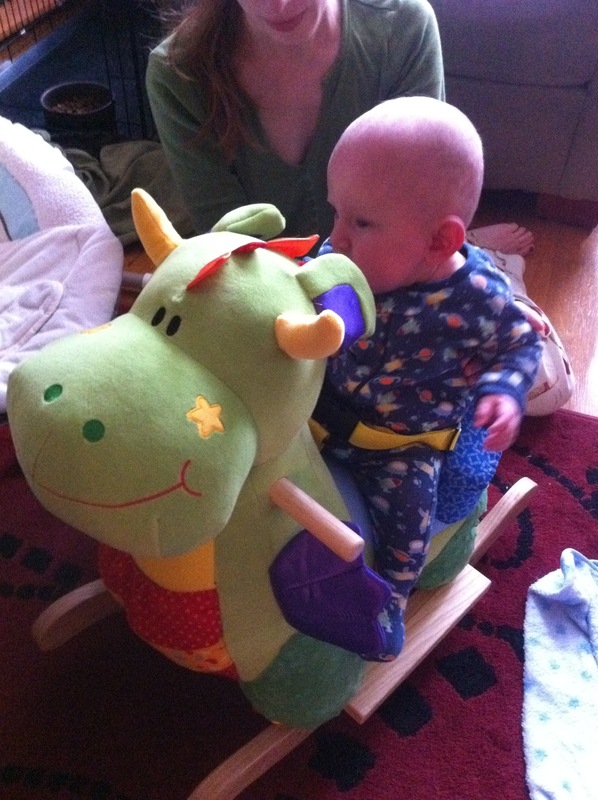 His therapist lets him play with lots of different things, exploring different textures, sights and sounds. Joe was in Atlanta for 4 nights, Cayman spent some well deserved time at Camp Bow Wow, and Amy and Benjamin had some quality time. We got a beautiful Christmas tree. Ben wasn’t a huge fan at first. Today Benjamin is having his NICU follow up appointment. Feels like a milestone! So someday soon hopefully we’ll put up a real blog post where we talk in detail about any of the above things, or something else new entirely. I just didn’t want to let the whole month slip away without checking in! I will *not* be cute for this picture! No one really cares about us, but look- a party! No baby!